What are the Small Parts of the DNA that Code for a Trait? Brown eyes, blue eyes, dark hair, light hair, very tall or extremely short: the observable characteristics that make humans unique from each other result from genes, which are segments of DNA that code for specific traits. DNA contains four chemical bases that pair together to form the DNA double helix: adenine with thymine and guanine with cytosine. The sequence of these bases in each gene, or section of DNA that codes for a protein, is responsible for most of the variations among humans. Geneticists call variations of the same genes "alleles." The nucleus of almost every cell in the human body contains the genetic blueprint for that human. This deoxyribonucleic acid, or DNA, contains genes. Since DNA contains four chemical bases which pair up in a very specific way along a backbone of sugar and phosphate molecules, DNA looks like a spiraled ladder, or double helix. The bases adenine and thymine always pair together, and the bases guanine and cytosine always pair together. 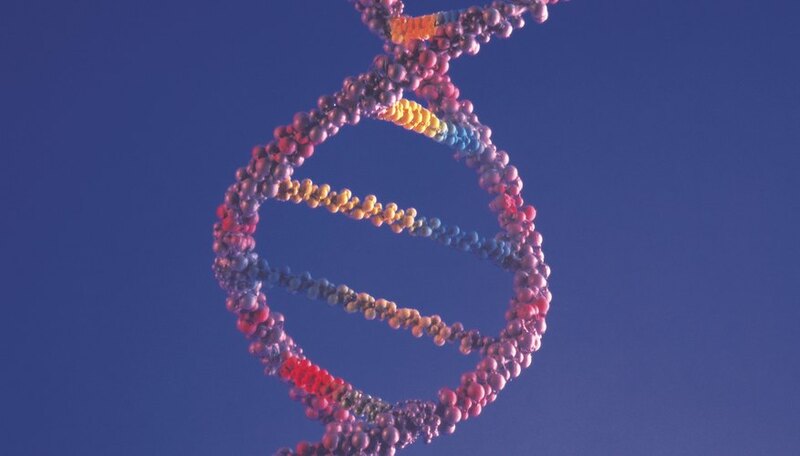 Scientists often refer to these bases using only their first initials: A, T, G and C.
The order of the bases in a strand of DNA is very important. This sequence instructs the cell’s machinery in the building of proteins, and segments of the DNA that code for proteins are termed genes. While humans receive one copy of each gene from each parent, resulting in two copies of each gene per human, a surprisingly small proportion of these genes are unique to the individual. In fact, more than 99 percent of human genes are exactly the same for every human on earth. The remaining genes, which represent fewer than 1 percent of all genes, vary slightly between individuals, and these alleles are responsible for the observable differences among people. Some genes are very small and contain only a few hundred DNA bases while other, larger genes contain many, many more bases: over two million bases for the largest genes. One of the most important tenets of science is the "central dogma of molecular biology," which describes the way the cell transcribes DNA into RNA then translates that RNA into proteins. During transcription, the DNA unzips so the cell can produce a complementary strand of messenger RNA, or mRNA. This mRNA travels out of the nucleus to the cell's cytoplasm where the ribosome reads the mRNA and builds a protein. Every set of three bases, called a codon, encodes one amino acid. These amino acids link together into long chains called polypeptides. Once folded, these become proteins and play vital roles in the structure, function and regulation of the human body. This is why a gene can be described as a section of DNA that codes for a protein. What Are the Subunits of DNA? Mayer, Melissa. "What are the Small Parts of the DNA that Code for a Trait?" Sciencing, https://sciencing.com/small-parts-dna-code-trait-17990.html. 16 July 2018.